This map of the British Isles is the work of Abraham Ortelius. It dates from 1590 and was published in Antwerp. It appears in the forth Additamentum to Ortelius's Theatrum Orbis Terrarum. Ortelius published these 'additions' to supplement editions of his atlas. The fourth Additamentum contained, in addition to new, more modern maps, a section devoted to classical history known as the Parergon. It is in this section that this map resides. Here the northern and southern parts of the British Isles are shown with British tribes, Roman town names and other information according to classical traditions. 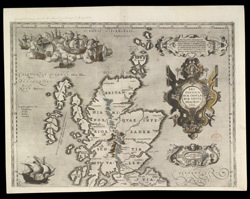 For this new map Ortelius has based the outline of England and Wales on that of Christopher Saxton, which portrayed the proportions of the land mass more accurately than before, with Ireland and Scotland remaining the same as the existing maps in the atlas. It is likely that the engraving was by Jan Wierix.